YouTube is in the process of testing an Incognito mode that's destined for its Android app. It wouldn't be the first service to acknowledge that sometimes, you just want to keep your browsing history under lock and key. Indeed, Google Chrome, Chromecast, SwiftKey and the Gboard keyboard app are already armed with the protection of an Incognito Mode, so it should come as no surprise that YouTube may soon get its own stealth feature. Surfing the net is becoming an increasingly user-tailored affair; every click is monitored and every video browsed gets carefully logged in YouTube's watch history, so its algorithms can keep feeding you recommendations. You can of course dive inside YouTube's settings menu and disable viewing (or search) history, but it's not instantly accessible, and might discourage some users from trying. Fortunately, the new Incognito Mode will show up in a much more prominent position. 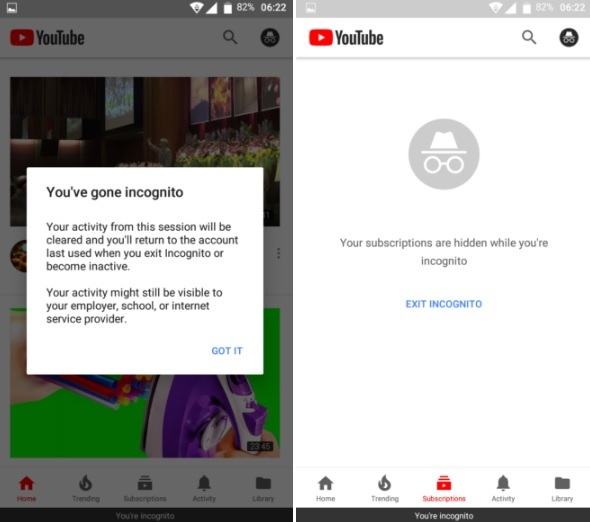 To access it, you'll need to tap your avatar in the top right hand corner of the YouTube app -- it should be available as 'Turn on Incognito' just below the Switch account/Sign out option. While undercover, your avatar transforms into the Incognito spy icon, and none of your activity is recorded. All your subscriptions are invisible too. If you can't see the mode on your Android device yet, don't worry. It looks like YouTube is conducting its Incognito test with random users before fully implementing the changes.